The lawn is a beautifully landscaped heaven with greenery all around. A special sitting theme around swimming pool with beautiful mounds in the backdrop creates an ideal place to celebrate your most important day. Putting people first, pursuing excellence, anticipating our customers’ needs and supporting transparency. Our experienced team turns your dreams into reality. You receive assistance from our professional team that will ensure that every little detail of your function is taken care of. Your wedding day is likely to be one of the most memorable days of your life, so it is important to choose the wedding venue that serves you as per your needs. 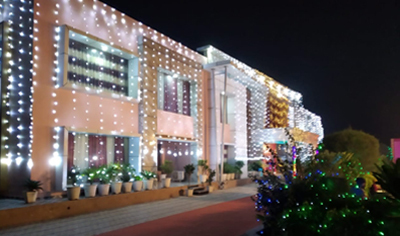 Exclusive wedding decors, theme weddings, lavish ambience and more makes us the best destination for your occasion. From the moment you enter the gates of Shah Farms till the last guest leaves, our team ensures that your function is everything you dreamed it would be. Choose Shah Farms now to indulge in an unforgettable experience that will leave an imprint on the hearts and minds of your friends and loved ones forever.